USE ON: Silk and all natural and synthetic untreated fabrics, untreated leather, suede, paper... just about anything! The 128 oz. (Gallon) sizes are dropship items. NOTE: The Gallon (128oz.) sizes are Drop Ship items! 32 oz. jars - Sorry, this item is temporarily sold out. 2.25 oz.8 oz.32 oz.128 oz. 2.25 oz.8 oz.32 oz. 128 oz. Jacquard Dye-Na-Flow Fabric Paint is a free flowing, concentrated liquid color for use on any untreated fabric. Works on untreated leather, suede, wood or paper too. It will spread on fabric until it is thoroughly absorbed and even. Every fabric has a different flow and spread. It is magical on silk, but it works on any type of fiber, natural and synthetic. On silk it has an even luster. On velvet it is rich. On cotton the color does not alter the feel of the fabric. Dye-Na-Flow is incredibly versatile. Jacquard Dye-Na-Flow is especially good for silk painting, either the serti (resist) method using water-soluble resists, or for watercolor techniques. You can spray or airbrush with it on just about any untreated fabric. You can dilute it with water and tie-dye using squirt bottles and then set the paint in a commercial dryer or with an iron. Really nice effects and it's fast and easy. Water based and non-toxic. Dye-na-flow Starter Set is a great way to get started with Dye-na-flow Silk Paints. Simply apply Dye-Na-Flow Fabric Paints to pre-washed fabric with a brush, squirt bottle, sponge, or airbrush. Let dry. Iron fabric for 3 minutes on dry setting appropriate for fabric. Wash in cool water with Synthrapol and rinse. Draw your design with an auto fade pen onto the fabric. Pour the water-based resist or gutta into a plastic applicator bottle with a metal tip. Hold the resist bottle like a pencil. Gently squeeze the bottle until the resist begins to flow. It is a good idea to practice on a separate piece of fabric until you get the feeling of drawing smooth, flowing, continuous lines. Begin drawing your pattern. Move steadily, but not so quickly that you leave gaps in your lines. All lines must be connected or the paint will bleed through the gaps in the resist line. Once youve completed the design, carefully examine the lines. Make sure the resist has penetrated through to the back. Go back and fill in any gaps. Let the resist dry completely. Use a hair dryer to speed drying time. Dip your brush gently into a color. Touch the brush to the fabric about 1/2 from the resist line. The dye will migrate the rest of the way. Paint all areas inside the resist lines. For large areas, work quickly painting the color from corner to corner. Always work wet to wet. Never go over a dry area. After you have finished your piece, let dry completely. Heat set according to instructions. Paint, squirt or sponge the Dye-Na-Flow on the fabric in an all over pattern. Sprinkle the salt onto the fabric. The salt should be applied immediately while the fabric is still very wet. The salt crystals will begin to soak up the dye as it dries. Let the salt sit on the fabric until the paints are dry. Brush the salt off of the fabric. Heat set the fabric according to the instructions. Using a brush thoroughly wet down the silk hoop fabric with clean water. Apply Dye-Na-Flow onto the wet fabric. While the fabric and paints are wet, arrange the paper cutouts, leaves and other items on the surface of the fabric. The closer in contact the object is with the fabric, the sharper your image will be. You may have to weigh down some objects so that they dont blow away. Leave the fabric out in the sun with the objects on it for an hour or more. Remove the objects and you will see a lighter image in the shape of the object. Wash in cool water with Synthrapol and rinse. Here is a downloadable sun printing project from Jacquard! What is the difference between Dye-Na-Flow, Jacquard Textile Colors, and Lumiere & Neopaque? Dye-Na-Flow is a very fluid textile paint that has the consistency of water. It can be used for water color like washes and silk painting techniques. Textile Colors are medium bodied semi-opaque paints ideal for fabric painting. Lumiere & Neopaque are light bodied, very flexible paints suitable for various surfaces such as leather, paper, & fabric. The Neopaques are very opaque and excellent for covering dark materials. The Lumiere line is a gorgeous assortment of metallics & pearlescents. Can I mix Dye-Na-Flow with Jacquard Textile Colors and Lumiere & Neopaque? Absolutely, all are acrylic paints and they work very well together. Keep in mind that the consistencies of each paint are different, so your resulting colors may be thicker or thinner. Can I use Dye-Na-Flow for airbrushing? Yes. 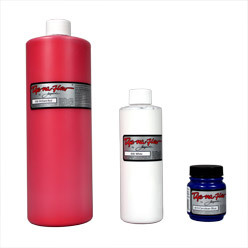 Dye-Na-Flow can be used straight from the bottle in an airbrush. I've followed all the directions for heat setting, but my paints are washing off. What did I do wrong? Make sure that you are using a dry iron at the correct temperature setting for the fabric. If you don't heat set at a high enough temperature for a long enough time, the paint may not be thoroughly set. Sometimes if you are using a top loading washing machine, it can abrade the paint from the fabric. Pre-washing fabrics before doing any surface treatments to remove any factory sizings may also help. Yes. Once properly heat set, Dye-Na-Flow is dry cleanable. How to dye ballet pointe shoes with silk paint and fabric markers. An excellent tutorial using Dye-Na-Flow, freezer paper, and spray bottles. Beautiful results from our friend Ashley at Lil Blue Boo! Another great step-by-step tutorial from Ashley Hackshaw. Step by step tutorial for decorating your own silk organza gift bag for wine or champagne. Step by step tutorial on creating a Snowman pillowcase with paints, lace, and glitter. Step by step tutorial on creating a hand-painted beach chair. Step by step tutorial on silk painting. Great tutorial for kids, adults, classes and groups to try out silk painting. Step by step tutorial on creating your own hand-painted table runners. Eight 2.25 oz. bottles of the most popular colors: (801-Sun Yellow, 803-Bright Orange, 806-Brilliant Red, 811-Violet, 814-Azure Blue, 820-Emerald Green, 829-Black, 830-White). Set contains nine 1/2 oz. applicator bottles, tips & techniques for use. I have used this on cotton fabrics and silk. I really like the ease of use and the color results. The colors on my cottons after they were heat set did not fade after the first washing. But yes eventually you do get some fading after washings. The silk results were just fine. The silk did not feel very stiff and yes using the Milsoft did help bring back some of the softness. 32 of 32 users found this review helpful. Beautiful rich vibrant colors which mix and dilute well. Work great for Serti watercolor and salt techniques. For large pieces take to a Dry Cleaner to have pressed for 30 seconds at 300 degrees using a "hot head" (heat only no steam). 27 of 27 users found this review helpful. WASH with COLD WATER!! I luckily made a practice scarf before using these paints for a silk painting workshop for high school aged students. I used Synthropal before painting and then again after heat setting my scarf with an iron. I washed it in HOT water since the Synthropal label says "works best with HOT water". All my colors disappeared! I was so disappointed! I read all the instructions I could find online and on the paint jars but nowhere did it mention to use cold water! A few more instructions would have been nice. But I called Dharma and they were very nice and helpful (as always) and said to wash Dyenaflow with Synthropal on COLD. Just tried that and it seems to have worked great! SO these paints were great! (Previously I have used the Tinfix silk dyes but I wanted something simpler to use and set.) I loved that these paints didn't stain your fingers for days (like some dyes) and it was nice to not have to steam set them. The colors were pretty and the students loved them! The items came on time. Thanks Dharma! I like Dye-na-flow. I have gotten some very intense colors silks without the whole steam thing. Be sure to dry completely then heat set carefully to maximize color. these colors are amazing on silk. So vibrant and beautiful. i love how far the 2.25oz containers go. I've been using Dye-Na-Flow for about 6 years (2018 now) and LOVE it!! I'm a professional batik artist (ie full time career) and I'd be really stumped if this was ever discontinued. I paint the dye onto cotton fabric and it works like a dream. Once dry it looks faded but when I apply the wax the colours brighten up returning to the vivid exquisite colours as they were when wet. In the end I iron off the wax. I either paint the dye directly onto the dry fabric less bleeding or apply it varying degrees of wet fabric to encourage bleeding. Unlike fiber reactive dye you can mix these and keep them indefinitely. I use then directly out of the jar and so have a large variety of colours to play with. They don't separate into crystals or pigment fragments which with other dyes I've tried can aggravatingly surprise you leaving tiny "alternate" colours in the middle of your work! I've ordered lots of the small jar and several of the medium sized ones in colours I commonly use. The dye also goes a long when you are painting as you mix with water to lighten. I also have a setasilk lightening medium that I can mix with the dye to lighten without making it too thin. Try this product if you're interested in batik and painting with dyes they are fabulous! Love love. love this product. My watermelon shoes turned out great! Beware the dye spreads upon contact with fabric. Once you get the hang of it you can gain more control of the pigment. Excellent colours for silk painting. Just loved the end result. Each colour is giving the right depth of the colour. Used various brands for silk painting but this is the best. Great color. However it washed of more than others used on the same work.